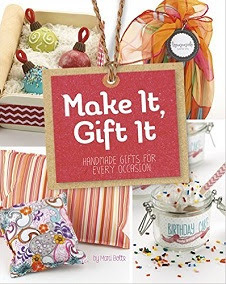 From homemade noodles to knitted mittens, from hand-cut marshmallows to fresh fridge pickles, even do-it-yourself wrapping paper, customized boxes, and ribbons good enough for royalty, Mari Bolte's Make It, Gift It: Handmade Gifts for Every Occasion (Craft It Yourself) (Capstone Young Readers, 2015) has plenty of ideas for year-round gifting. Inside this book, find a recipe for two-color rolled cookie dough, all dressed up in clear wrap and ready to slice and bake. Noodle Nests are knots of hand-cut pasta, dried and ready to pop into the pot which can be made, with the addition of veggie juices (spinach, carrot, or tomato sauce), in lively colors, and there are savory, spicy toppings to turn plain-Jane oyster crackers into gourmet croutons. There are woolly mittens, cut and stitched together from cast-off sweater parts, a personalized phone charger stand, and layered-in-color candles contrived from leftover wax from those almost-used up jars. There are also directions for hair ornaments, bright pillows made from bits and pieces of old garments, and clever braided scarves from old tee shirts with that boutique look. And author Bolte doesn't leave the crafter hanging when the gift is complete. Directions for creative wrappings from all sorts of surprising sources dress up the finished products, with step-by-step instructions, materials, and how-to photos demonstrate how to make distinctive wrapping papers, gift tags and cards, and handmade bows from strips of tulle, newspaper funnies, or simple braided twine as well as the staple curling ribbon. With over fifty things to make and give, there is something for everyone here.